Its been a real struggle trying to figure out what works for my super annoying skin. I have extreme combination skin, for example I have dry patches, but with oiliness over the top of the dry patches. How does that even make sense?! However, I have found two products that have helped to keep my skin calm, and helped out with my strange skin troubles. Bio-Oil – I’m sure everybody has seen bio-oil, and most likely used it. If not, basically its just an oil that can be applied onto scars, stretch marks, acne, you name it. A multi purpose oil. What I’ve found this works best for on me is getting rid of spot scarring. I’ll pop a spot, and then I’m just left with this lovely red mark on my face for months after. This is really helping to fade those scars quickly. It sinks into the skin nicely, and doesn’t feel greasy at all. I’d really recommend this if you suffer from scarring after getting rid of spots. 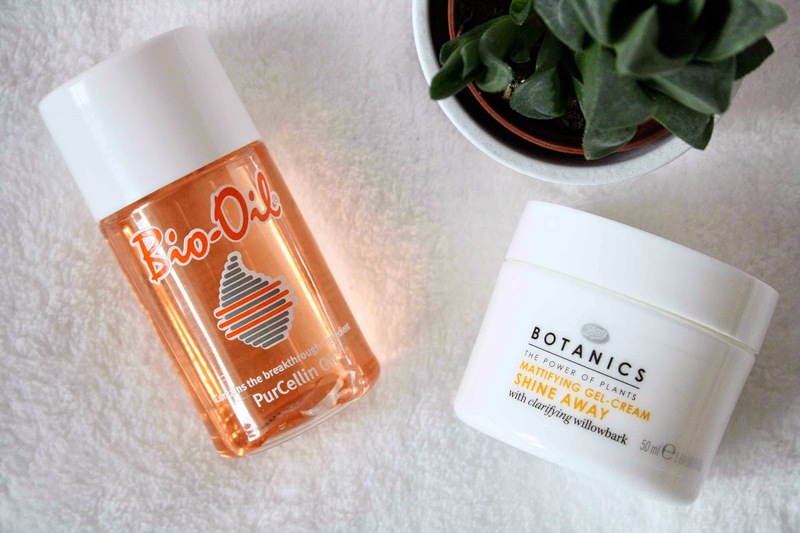 Botanics Matifying Gel Cream – A long while back I did a brief post on the ‘botanics’ range in Boots. Anyway, after a long time of this sitting at the back of my bathroom cabinet I decided I’d stop neglecting it and give it a proper go and see what it was all about. I am so glad I did. If you suffer with oily skin, you’re most likely going to love this! Its a gel cream, that you just pop over the most oily parts on your face and it mattifies and takes away the oiliness. Its not at all drying, it sounds like it would be, but I promise its not; its actually quite moisturizing as well as being mattifying. I’d really recommend this as well if you suffer with oily skin, I’ve been loving it and its super cheap too! What are your skin care saviours?